If you think that these three habits help you snooze, you lose. NYU researchers reviewed more than 8,000 websites to flag the 20 most common misconceptions about sleep, and then tapped a team of sleep experts to rank the myths based on their health risk and whether they had any science to support them. And most deluded dreamers believe that sipping a nightcap and getting just five hours of shut-eye a night is fine, and that snoring is harmless. Dream on. These and other common bedtime mistakes wreak all kinds of havoc on sleep health. More than a third of American adults are sleep-deprived, according to the CDC, getting less than the recommended seven hours of sleep a night. This costs the U.S. economy $411 billion a year in lost productivity, as insufficient sleep is linked to daily stress, lack of alertness and memory problems, as well as chronic conditions such as obesity, diabetes and stroke. And Americans spent $41 billion on sleep aids in 2015, which is projected to hit $52 billion by next year. Study author Dr. Rebecca Robbins, a postdoctoral fellow at NYU Langone Health, told MarketWatch that her goal was to identify the most common sleep mistakes that people make, and educate the public on better sleep hygiene. And what many of these myths have in common is that they impact deep, restorative sleep. Robbins and Dr. Sanam Hafeez, a neuropsychologist in New York City, walked MarketWatch through the three biggest sleep myths her team found, and the tweaks you can make to better your bedtime routine. Another common misbelief is that five hours of sleep or less is enough. If you’re struggling to fall asleep at bedtime, lying awake with your eyes closed is not the same as sleeping. “It’s like standing on a treadmill and not moving; you’re there, but you’re not doing what you showed up to do,” said Robbins. Rather than tossing and turning, do a calming activity like reading a book, sorting socks or making a cup of tea. (Don’t look at screens; the blue light messes with the body’s internal sleep clock.) It’s also important to sticking with a consistent sleep schedule — so even though you might be free to stay up late and sleep in on the weekends, your overall sleep health benefits most when you go to bed and wake up at the same time every day. Supplementing missed sleep with short naps can also refresh you on days when you didn’t get enough rest the night before. But, “while a siesta can help you feel better and fight off a lot of the side effects of sleep deprivation … as common practice daytime naps are not an adequate way to complement your nightly sleep deficit,” added Hafeez. Loud snoring is harmless, albeit annoying. Yes, about 90 million Americans snore, and half of them are “simple snorers” or “primary snorers,” which is perfectly fine (although it might disrupt your partner’s sleep). But about half maybe have obstructive sleep apnea, a potentially serious disorder in which your breathing repeatedly stops and starts during sleep due to the upper airway becoming blocked. So if your sleeping partner is snoring loudly and shows interrupted sleep during the night — or people have elbowed you in the night and told you that you’re doing the same — then it’s important to get checked out by a medical professional. This is linked with higher BMI, so lifestyle changes such as getting more exercise and maintaining a healthy weight can treat sleep apnea. A doctor can also prescribe wearing a continuous positive airway pressure (CPAP) device at night. Drinking alcohol before bed improves your sleep. Here’s a buzzkill for those who enjoy a glass of wine or a nightcap before bed. “There’s this old wive’s tale that persists about the nightcap that may be good for sleep,” said Robbins. But it reduces your body’s ability to go into deep sleep, so you wake up feeling unrested. “Alcohol will give you the sensation of drowsiness, but it will keep you in a superficial state of sleep. The next morning, depending on how much you drank the night before, you will not feel as optimized for the day as normal,” said Hafeez. Plus, you’ll get up in the middle of the night to use the bathroom more often because alcohol blocks the reabsorption of liquid in the body, which both dehydrates you and fills your bladder more quickly. It’s best to stop drinking 30 to 90 minutes before bed, so you can go to the bathroom. 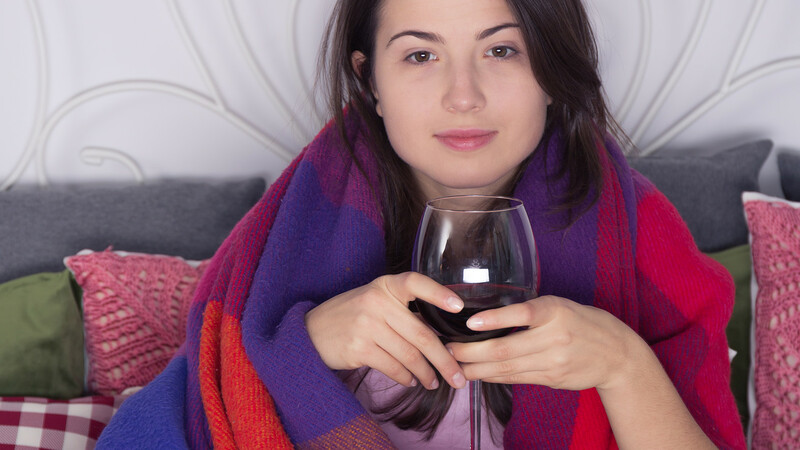 Robbins also recommends swapping your wine with a cup of uncaffeinated tea, or another soothing activity such as aromatherapy or reading to get you to wind down. For more tips on falling a sleep and staying in la-la land, these 4 sleep experts shared their own personal routines for catching Zs. January 11, 2019 Comments Off on How much has the shutdown hit the US economy?